Native American Turquoise Jewelry is an American heritage that began around 1865 when a Navajo Blacksmith by the name of Atsidi Sani learned how to work with Silver from the Spaniards. It is believed that Atsidi Sani incorporated Turquoise into his Silver Jewelry around 1870 as Turquoise Jewelry was already being made into adornments by the Santo Domingo Indians and traded to the Navajos and it was very important to the Navajo. Durango Silver Company has just completed two great new informational page on Native American Turquoise Jewelry that you are certain to appreciate, check them out! Native American Turquoise Jewelry has developed substantially in the last 150 years as the Native American Indians of the Southwest have been very prolific in creating Native American Turquoise Jewelry and the market for their Jewelry has been nothing short of remarkable. The quality of Native American Turquoise Jewelry has never been better than it is today. Native American Silver and Goldsmiths have made unbelievable progress in the development of their trade due to modern tools, demand for quality by the buyers and their own desires to be the best in their trade. The Turquoise in Native American Turquoise Jewelry is an important discussion! There were absolutely high times for the production of quality Turquoise which was approximately 1930 – 1980. Native American Turquoise Jewelry had become a major market which encouraged individuals to hunt for new Turquoise deposits in Nevada, Arizona, Colorado and New Mexico, they did and they found many wonderful Turquoise deposits. The Native American Turquoise Jewelry market grew exponentially from 1930 to date but many changes have come, the biggest was the Chinese Turquoise entering into the marketplace. 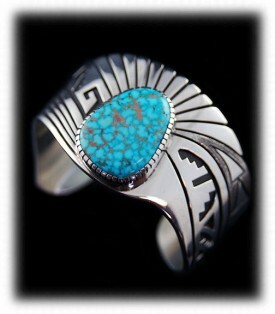 This has had a major impact as most of the Native American Turquoise Jewelry you see today has Chinese Turquoise in it. The other fact is that the quality of Chinese Turquoise has seriously taken a dive for the worst and now they are even making Turquoise from cement! At the 2011 Tucson Gem Show the word from the Chinese Turquoise dealers was that the Chinese government had put a 3-5 year moratorium on the mining of Turquoise. In addition, due to the tough mining policies of the U.S. government, Turquoise mining in the U.S. has fallen to an all time low. The once stock piles of authentic Turquoise are diminishing quickly. Quality Native American Turquoise Jewelry depends on high quality authentic Turquoise and we can see trouble coming soon. There is no question that high quality Native American Turquoise Jewelry with high quality natural authentic Turquoise is about to become very valuable and highly collectible by the wealthy. Silver and Gold have sky rocketed, Turquoise is sky rocketing unbelievably and the desire for handmade products and quality American made products is on the rise. There are very few Native American Turquoise Jewelry dealers that focus on authentic American Turquoise as most are trying to compete with the China syndrome. 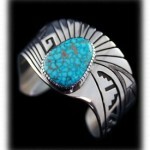 Check out Durango Silver Company as well as their Turquoise Jewelry Learning Center, they are totally dedicated to quality and authenticity as well as being a family owned business located in the heart of Turquoise Country – Durango, Colorado USA and specifically deal in quality Native American Turquoise Jewelry.